My Home and Garden: Keeping kale, lettuce and greens fresh for a LONG time. Keeping kale, lettuce and greens fresh for a LONG time. Neighbour Judy gave me a bunch of her very beautiful kale the other day. Now you know I love kale. I really love kale. I was looking for a bag to put it in the fridge. 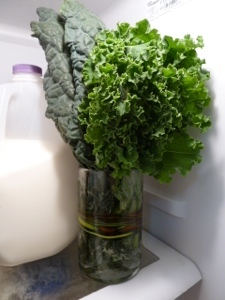 It just came to me suddenly to put the kale in a container of water like a flower. I put the kale in a water glass in the fridge. Tonight I bought some Lacinato or Dinosaur kale from farmer Dan at the market. I put it in the cup with the two remaining sprigs of Judy's kale. Look how fresh it looks. It has been almost a week. It is firm and crisp.